Do the words cleaning and decluttering fill you with joy or make you want to run to your next Netflix binge session? We all know our homes and classrooms need a deep clean and rejuvenation from time to time. You might find your craft cupboard is overflowing or your wardrobe is a mess. A good clean out can make you feel more refreshed while creating an attractive and productive space for all. Our online spaces are the same as our physical spaces. They can get messy or outdated even if you have some good routines in a place. Taking the time to give your blog a good once over every now and then will pay dividends. Spring has sprung here ‘Down Under’ but whatever the season, a periodic tidying up of your blog has many advantages. Whether you run a class or professional blog, there are clear benefits to having an organized blog for yourself and your readers. 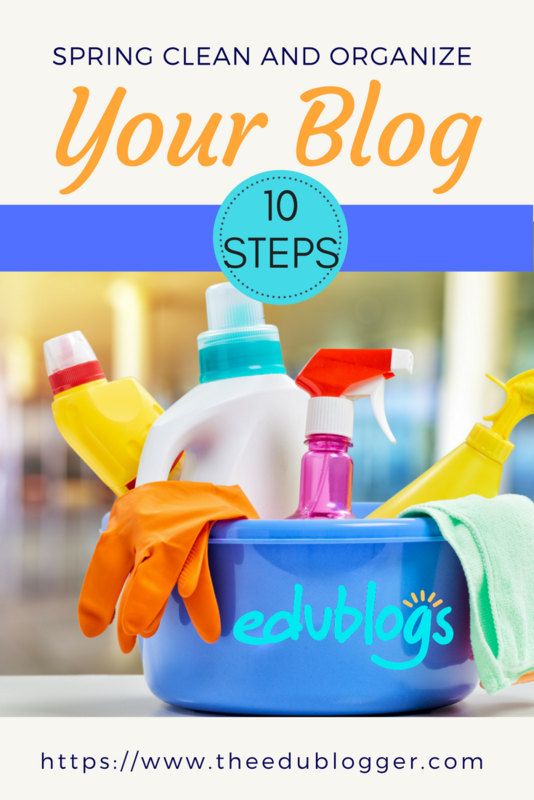 This post goes through ten steps to audit, tidy up and refresh your blog. You might set aside a chunk of time to go through these steps, or challenge yourself to complete one step each day or each week. There’s even a handy checklist at the end of this post. Perhaps you could display it in your office space to inspire yourself and others. Task: Analyse your theme, header and tagline; update if necessary. Are you happy with the way your blog looks? If you visit other blogs regularly, you may have noticed that the design of blogs has evolved over the past few years. 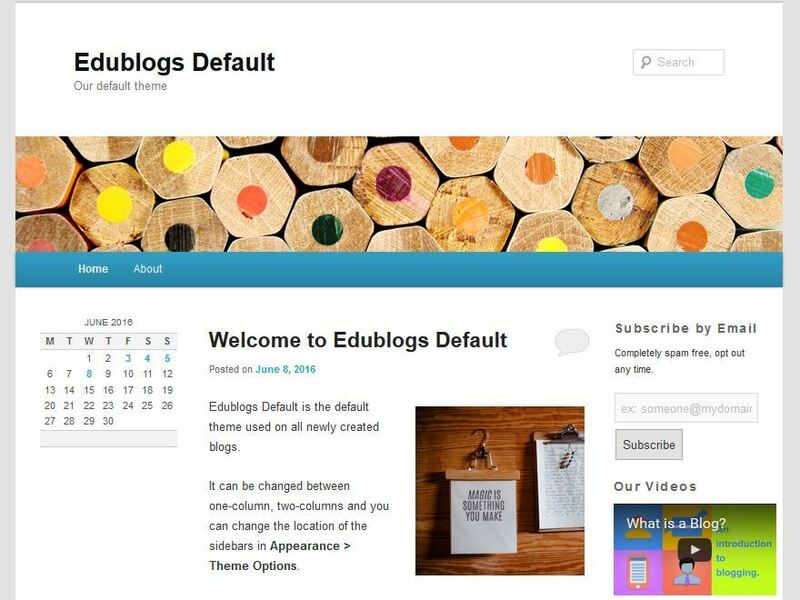 The Edublogs ‘default theme’ was once very popular. It displays posts in reverse chronological order. You would see pages up the top and sidebars on the left and/or right. There are now a diverse collection of themes available. Many look less ‘bloggy’ than they used to. There are magazine style themes, portfolio themes, slider themes and more. With many people now using their phones and tablets to access the internet, a responsive (mobile friendly) theme is essential. It’s also necessary to consider how easy it is for people to navigate your blog. Personally, I’m preferring themes that only show you an image and excerpt from each post on the home page (like the theme we use here on The Edublogger). This means you can scroll down and preview posts you might be interested in reading without having to scroll through the whole post. Magazine style themes or those that display a feature image can look great too but do require high quality images to really impress. Is it easy to navigate, read and find things? Is it attractive and creating the impression I’m after? Am I happy with a traditional looking blog, or is it time for a whole new contemporary look? The choice is yours but whatever your preference, the Edublogs help guides will assist you to overhaul the look of your blog with ease. Most themes now allow you to upload a custom header image. This can be a fantastic way to personalize your blog. Making a professional looking design that combines images and text with a free tool like Canva or Adobe Spark. We also have an easy tutorial on how to make a custom header image using PowerPoint. While you’re looking at your blog design, consider whether to update your tagline. By default, it will say “Just another Edublogs site”. While it’s great to share the Edublogs love, it’s even better to customize your tagline! Write a few words/sentences about who you are, your motto or what your blog is about. Find out how with our step-by-step tutorial. I used to use the tagline on my class blog to give visitors a snapshot of who we are. Task: Determine whether there is anything that needs to be added or removed from your sidebar(s). Traditionally a blog would have a sidebar on the left and/or right. Many contemporary and minimalist themes have abandoned these sidebars altogether. You might notice here on The Edublogger we are using a minimalist approach. Your choice of sidebar positions and widgets are again a matter of personal preference. However, many bloggers now prefer to streamline their blogs by only including essential widgets on their sidebar(s). In the past, I have seen student bloggers struggle with this concept and enthusiastically fill sidebars with a joke of the day, virtual pets, Vokis, calendars, visitor counters and more. Widgets are a balancing act. They can be fun and informative for both the blogger and the reader, however, if your main aim is for readers to be viewing and commenting on your content (posts and pages), you probably don’t want to provide too many distractions. Furthermore, overloading sidebars with widgets can slow down your blog. This means potential visitors could be sitting twiddling their thumbs while the blog loads. Not ideal. Is this widget adding to my readers’ experience on my blog? Is it essential, or should I remove it? Are there any widgets I should add to my sidebars to make my blog easier to navigate and understand? Task: Ensure visitors have a way of staying in touch and finding new content on your blog. First time visitors to your blog might like what they see and decide they would like to return regularly. It’s a good idea to give your audience options to make finding your new content easy. A simple way to encourage return visits is to set up an email subscription. This means readers will get an email every time you publish a new post (if you have a class blog, it’s a good idea to educate and encourage parents on how to sign up). Setting up an email subscription is simple, as this help guide explains. If you’re active on social media in a professional sense, it can be helpful to include your social media profiles so people can follow you. Interacting with your audience on social media can be a good way to grow your professional learning network (PLN). If you’re using Edublogs or CampusPress, there is a social media icons widget that is simple to set up. Alternatively, you can get a code from each social media platform and add it to a text widget. For example, if you want a Twitter follow butter on your sidebar, you need to visit the Twitter Publish page. It is also easy to add sharing buttons to your posts and pages so your readers can easily share your content on Twitter, Facebook and other social networks. Making it easy for readers to share your posts means your work could potentially be seen by a larger audience. Our step-by-step instructions should make it simple to set up these sharing buttons. Task: Add, remove and update your pages as necessary. I don’t know about you, but the first thing I generally do when visiting a new blog is head to the About Page. I’m always curious about who is writing the posts and where they are from. Unfortunately, there are a lot of blogs that don’t have an About Page. Don’t leave your readers in the dark; if your About Page is missing our outdated, now is the time to fix this. For more comprehensive advice and examples, be sure to check out the Publish An About Page guide. An About Page is not the only type of page you could have on your blog. When spring cleaning, consider if any other pages need to be removed or added. A Contact Page is often a good idea in case your readers would like to communicate with you further. Parents might want to get in touch, or educators from other schools might like to discuss a collaboration. The easiest way to add a contact form is with a plugin. If you already have this set up, send yourself a test message to check if it’s working! A third popular page format is a Sneeze Page. Great name, huh? This is a term I heard from Problogger, Darren Rowse. It is simply a page where you add a collection of links to old posts. For example, on my personal blog, I have a Sneeze Page for posts about educational blogging and one that collates my digital citizenship posts. Adding a Sneeze Page to your own blog could be a good way to encourage readers to visit old posts that are still relevant but are buried deep within your archives. Overall, having one or more pages on your blog can be a good way for readers to learn about you and your blog. What can you do to refresh your pages? Task: Determine which of your posts have been the most popular and update or replicate. Which posts resonate most with your readers? Have you ever checked this data? The simplest way to do this is right in your dashboard, via statistics. If you are using Edublogs Pro or CampusPress you simply need to go to Dashboard > Statistics to find out about your visitors and most popular posts. This data is sourced from Google Analytics. The Content module displays the posts and pages that visitors have accessed most frequently over the past month, three months, or last year. This is obviously not something you could do in one sitting, but when giving your blog a spring clean, you could take a look at your statistics and come up with a list of a few posts you could update in the future. At the top of the old post, write a blurb to tell readers it has been updated, and link to the new post. Or, a better option may be to simply redirect readers from the old post to the updated one using Safe Redirect plugin. Note: If you’re interested in more detailed data about your blog visitors, you can set up Google Analytics. Task: Sort through your drafts folder and take action where necessary. Are you the type of blogger to start many drafts that you never end up publishing? Or is it more your style to always complete what you start? If you have some unpublished drafts, it can be a good idea to revisit them from time to time. To view only your drafts, visit your dashboard and go to Posts > All Posts then you will find Drafts towards the top of the screen. Clicking on this will filter your posts so you can just view your drafts. Some people use drafts as a way to list blog post ideas. For example, you might think of an idea for a blog post so you begin a quick draft with some key points. Over time, your dashboard can become cluttered with drafts. This is all about deciding what works best for you. Task: Develop or revise your understanding of categories and tags. Begin tidying up your categories and tags. If you use a WordPress blogging platform, like Edublogs or CampusPress, you are probably familiar with categories and tags. They are used to organize your content and help readers find posts that interest them. When I first started blogging, my understanding of categories and tags was very basic and a little inaccurate. The categories and tags on my own blog ended up in a bit of a mess because I used to overuse categories and create too many etc. Is this a familiar story for you? The first step to organizing your categories and tags is understanding how they work. Categories are meant to provide a broad grouping of your posts. Tags are used more for describing specific details and to create groups of content that can apply to multiple categories. Both tags and categories are important to help readers find your content. For example, on a class blog post, one category might be Maths and tags might include addition, geometry, homework, assessment etc. Some teachers tag students’ names too (if students wrote the post or if their work was showcased). Categories and tags only apply to posts, not pages. Every post needs at least one category. A common recommendation is only having one category per post, or two at the most. It is generally recommended that you avoid having too many categories on your blog overall. Only start a new category if you will be writing other blog posts that fit into that category. Tags are recommended but not essential. The ideal number of tags is not an exact science. No more than 5-10 tags per post is a commonly suggested ballpark range. Capital letters do not matter (Blogging and blogging are considered the same), however, consistency is always visually pleasing. Avoid duplicates: some experts recommend not having the same category and tag name (eg. avoid having a category called Literacy and a tag called Literacy). It’s also a good idea to avoid having similar or plural categories (eg. having a category called Maths and one called Math). Once you have your head around how categories and tags are best used, it’s time to see what tidying up you need to do. One option is to go to Posts > All Posts. From here, you can do a quick edit of each post and narrow down the categories to one or two, while making sure your tags are relevant. If you have multiple posts that need their categories and/or tags edited (to the same thing), there is also a bulk edit option. Another time saving option is to go to either Categories or Tags which you’ll find under Posts in your dashboard. 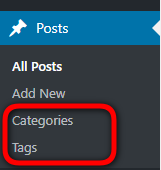 If you go to Categories, you can select posts and use the options under the drop down menu to merge categories, convert categories to tags, or delete categories. You can use the same bulk edit process with tags (Posts > Tags). Once you’ve done some tidying up, it will hopefully be easier to stay organized and consistent with your use of categories and tags in future. Task: Approve or delete comments. Ensure comments are receiving replies. As a blogger, a key goal is probably for visitors to read your posts. Even better if visitors take the time to post a comment! You may have heard of the 1% rule? This is an idea that 99% of your audience will be lurkers who don’t interact, while 1% will engage with commenting etc. We need to encourage (or increase) this 1%! First and foremost, I believe it is polite to respond to someone who has taken the time to leave a comment. This is habit I would strongly encourage students to get into as well. The simple act of replying to a comment (even with a quick thanks) will no doubt reassure readers that their comment was read, and encourage them to return. A simple comment can be the start of a fantastic ongoing relationship which could lead to amazing things. Does this sound like an exaggeration? Many of the strongest connections I have made with my PLN started with a simple blog comment. In time this lead to working on global projects together with students, meeting and presenting together at conferences, and a whole heap of learning and sharing. Priceless experiences! When giving your blog a spring clean, head to the Comments section of your dashboard. From here, click on Pending to see all the comments that need to be approved (or trashed if they are silly or unwanted). A great goal is to keep the number next to Pending at 0! You can also click on Spam to make sure no genuine comments have ended up here. The easiest way to reply to comments is in your dashboard. You might want to get into the habit of replying to comments as you approve them for maximum efficiency. If you’re running a class blog, you might also set up a system to have students and/or parents help you with replies. If you have further questions about managing comments, our help guide should provide all the answers you need. Task: Take the time to find some other blogs to read and leave some comments. Sometimes we are so busy maintaining our own blogs that we forget to visit other blogs. You will no doubt experience the most benefits of blogging and professional growth when you venture beyond your own blog to other class or professional blogs. As I mentioned in step 8, you really never know where a simple comment could lead! Building your audience can stem from being an audience. The simple act of commenting and being a part of the education community can really grow your own readership. Where can you find other blogs to comment on? If you’re looking for class blogs, we have compiled a list which is updated approximately twice a year. The Student Blogging Challenge participant list is also a great place to find student and class blogs. There is an amazing education community on Twitter and this is an excellent place to get to know other educators who blog. New to Twitter? This guide should help! We are planning to publish some lists with great examples of blogs over the coming months which should give you more ideas and inspiration. Stay tuned and make sure you are subscribed to our free newsletter. One of the most exciting benefits of blogging is the possibility for connecting and collaborating globally. Don’t miss out on this opportunity. Task: Set yourself some future blogging goals. Congratulations! If you’ve reached this point you are hopefully on your way to having a refreshed and rejuvenated blog. 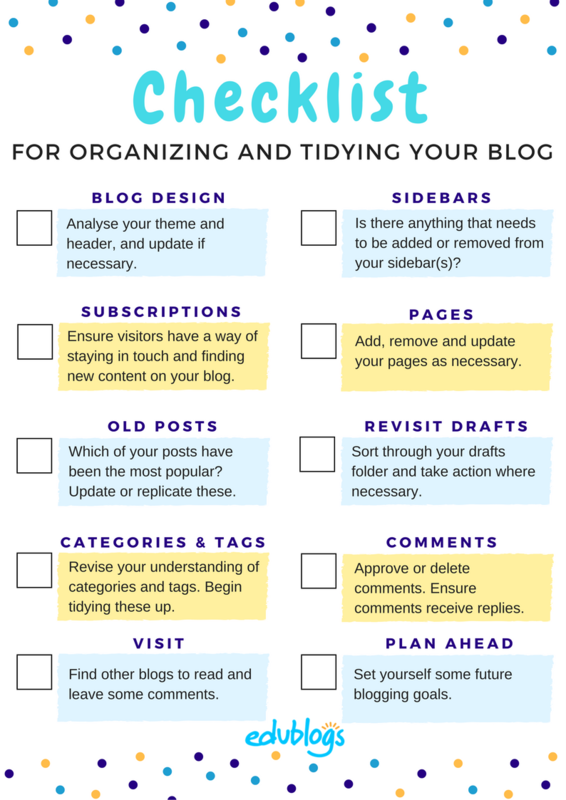 Just one small task lies ahead and that involves thinking about what you can do to keep your blog organized and how you can extend yourself as a blogger. What daily or weekly habits could you put in place so little tasks don’t add up? What are some ideas for future blog posts or what old posts could you update? Maybe write these down. What routines could you put in place to make sure you have time to blog regularly? We have a comprehensive post with ideas about finding time to blog that may help. How can you network and become part of the education community? We have a course all about this if you want to delve further sometime. We have created a checklist to help you keep track of these ten steps. Feel free to print, save or share it! If you have student bloggers you might even assign them some tasks to organize their own blogs. If you’re anything like me, you’ll always feel like there is something that needs doing on your blog. Nonetheless, there’s nothing like a good clean up every now and then to really renew your motivation for blogging. Good luck! We’d love you to leave a comment on this post and tell us how you went with the tasks. We’d also love to know your goals for keeping your blog organized in future. 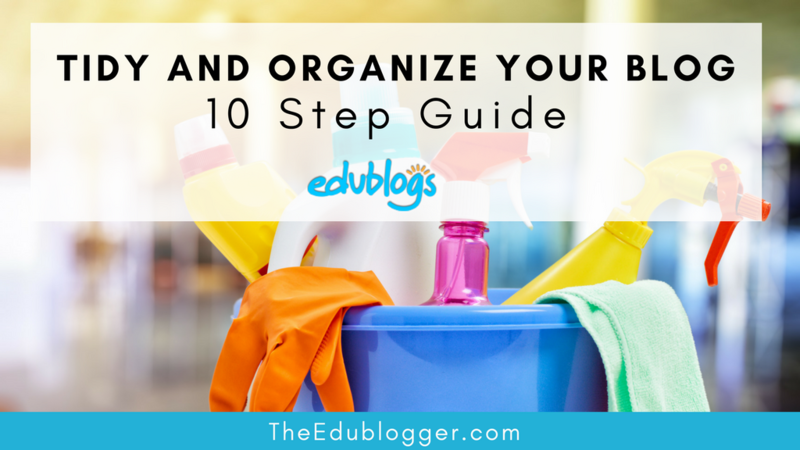 Do you have any other tips you could share about tidying and organizing your blog? Such a great information,Thanks for sharing this informative post. It is helpful and useful. this is a very good idea to get a better cleaner blog. If theirs a virus on your blog, how will you fix that? Blogs hosted by Edublogs have virus prevention and detection so this isn’t a problem. Useful as always. I never knew that those ‘collection’ pages were called sneezes. There you go. If I were to add anything, it would be a spring clean for those teachers who may have been looking after blogs and need to pass them on or something? I know that you spoke about having on-going student blogs ala Geelong College. However, this is not always the case. I always appreciate your feedback. I’m not sure if Darren Rowse just came up with the term sneeze page but I’ve heard it a few times and I think it’s a pretty apt description! Excellent point about blogs at the end of the school year. I know Sue has written about this before but this advice could do with an update. Thanks for pointing it out! Thanks for the tips. Your post has really helped a lot. And before I read this I definitely felt like snuggling on the sofa with some friends watching Netflix! Thanks so much. Haha, that is so great to hear. Now you can hit the sofa! Your blog post has benefitted me. I decided to clean up my blog and I can happily say I am satisfied with my work. And yes, I really felt like going to binge watch my favorite Netflix show. Keep up the good work! Thanks for taking the time to let me know! Isn’t it an awesome feeling after you’ve done some organizing?